Can you make these posters available as an 8.5 x 11 300dpi PDF so I can print some and post them? I'm not feelin' it from the teeny-weeny JPEG file. Updated with a Hi=res pdf, it's scaled to 11x17, but acrobat should let you print at 8.5x11. I must know, who designed these? They're awesome. They were donated by our marketing firm Saatchi & Saatchi. Hopefully we'll be able to get a few shirts out too. We'll definitely have others available. please please please make these tshirts, im tempted to just use the PDF and make my own online! 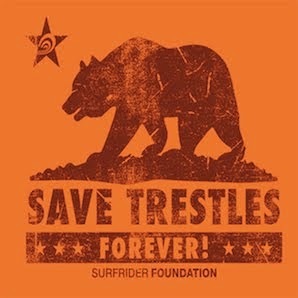 But id rather give the money to surfrider.